VAMBOA: GI Benefits for Business Instead of Education? In what could be groundbreaking legislation, members of Congress are considering a bill that would allow Veterans to use their GI benefits to start businesses, rather than using them for a college education. Appropriations Subcommittee on Military Construction and Veterans Affairs member Rep. Jeff Fortenberry (R-Neb.) is drafting the legislation, which could potentially lower the $1.4 billion the Pentagon spent in 2013 on unemployment for former military personnel. Sen. Jerry Moran (R-Kan.), a member of the Veterans’ Affairs Committee, will introduce companion legislation in the Senate. The idea has the backing of the military service organizations the American Legion, Iraq and Afghanistan Veterans of America, and others. The education benefit can be as much as $260,000 for four years at a private college or university. For Veterans who aren’t interested in attending college or transferring their benefits to a dependent, this would be a great option. It certainly is better than leaving the benefit on the table. Congress has worked in the past to help veterans receive small business loans. The Servicemen’s Readjustment Act of 1944 was a similar law that allowed Veterans to buy a farm, home or business property. It expired in 1956. Fortenberry’s bill would create a three-year pilot program for 100 eligible veterans each fiscal year. Participants would be able to use up to three years of educational benefits to start or purchase a qualified business. Participating Veterans would have needed to serve three years of full-time active duty. If they left active duty due to a service related disability, the time period is reduced to 24 months. Veterans would be required to apply for the program no more than 15 years after leaving the service. In order to move forward with the program, Veterans would have to attend a boots-to-business course at an accredited university. Another caveat is that they would have to have their business plans approved. The business startup modification to the G.I. Bill would have to be drawn up with safeguards to ensure that veterans have a chance for success. Since most startup businesses fail, the G.I. Bill proposal would need guarantees that Veterans applying for the program would receive mentorship and training. VAMBOA: Ready to Start Your Own Business? 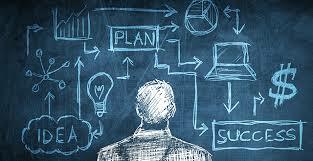 Starting a business involves planning, making key financial decisions, and completing a series of legal activities. But for many Veterans, transitioning from service member to CEO may be a more natural path than they might have imagined. Most experts agree that the two biggest components for Veterans preparing to start their own businesses are choosing the right kind of business for them, and securing capital. They also recommended that aspiring business owners take time to think about where their passion lies. VetFran Manager George Eldridge encourages Veterans interested in business ownership to do their research and examine all possibilities. “In the military you think, ‘I can’t fail,’ but sometimes you have to think about the risks you’re getting into and have a balanced expectation when getting into something like this,” he said. Veterans who are considering franchise ownership may want to start by surfing VetFran’s website. With more than 100 different franchise industries to peruse, there is something for every interest. The most popular franchises are in the food industry, followed by hospitality, home-based businesses, child care and pet care. 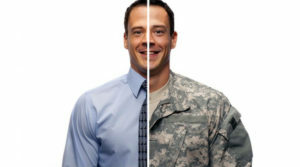 Although VetFran does not offer funding, it connects Veterans with funding assistance by working closely with the SBA and lenders within its supplier group. 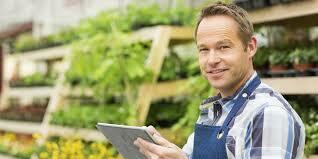 The SBA offers a checklist for Veterans interested in starting a business. It suggests starting with a business plan, which is like a roadmap to determine your starting point, where you are going, and how to arrive at success through proper planning, preparation and management. The checklist also covers things like licenses, tax ID numbers, taxes, finance, location, etc. Financing opportunities are plentiful for Veterans. The SBA, through its 68 field offices around the U.S. and 1,000 resource partners, has Veterans Business Outreach Centers around the country offering information on how to gain access to capital. For Veteran-specific programs, the SBA helps businesses obtain reduced loan fees for any loan under $350,000. Leveraging Information and Networks to Access Capital (LINC) is an online tool that connects loan seekers and lenders. By answering just a few questions, applicants can reach out to lenders all over the country. It seems that you can’t watch an hour-long news program without the mention of at least one of many hardships Veterans are facing. Along with VA scandals, there are struggles with PTSD, unemployment, homelessness, and underemployment. These societal ills have scourged all generations of Veterans, and are taking an extreme toll on the Post-9/11 generation. But from pain and discomfort, the strong usually seek ways to improve their situation. It is for these reasons that Veterans are 45% more likely to seek self-employment through entrepreneurial ventures that their non-Veteran peers. Efficiency– It is commonly joked about that the most effective military leaders are the ones who are free to goof around on their computer all day. While we know that this isn’t true, the culture of military leadership is to prioritize tasks and delegate work as needed. Veteran business owners are more likely to heighten efficiency by delegating tasks, freeing them up for more critical tasks. 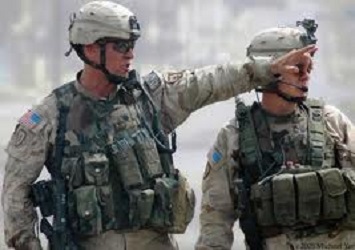 Leadership– Everyone in the military answers to somebody else, and at some point in their career, most enlisted personnel have others below them. Taking and giving orders is a skill, just like anything else, and Veterans have had some of the best training around. Those with military leadership experience have the conditioning to make important decisions and assign tasks in a manner that can instill confidence from their employees. Team Building– Veterans know that the key to accomplishing any mission is to have all members of their team working together, as one unit. It doesn’t matter if that mission is securing a building, cleaning the workspace, or meeting a sales quota, the principles are all the same, and Veterans have been conditioned with the mentality to apply that principle to any task. Selling Commitment– Most living things instinctivelydo whatever they can to preserve their lives. Service members rush towards danger. That’s not by accident, that’s by mental conditioning and by being sold on a commitment to your comrades, to your unit, and to your country. There are no better cheerleaders and brand sellers than military personnel and Veterans. Gathering Intel– This is an attribute that is often overlooked. But because of the thought process involved with immersing one’s self into battle, Veterans have been conditioned to study the field, know the rules of engagement, and keep a constant tally on their assets. This type of thinking is second-nature to those who have served, and comes in handy when developing and carrying out a business plan. Veteran business owners apply these same skills to their businesses. There are numerous other skills and attributes that Veterans picked up through their military experience that contribute to their success as business owners. With the right resources and the right mindset, Veterans know that they can accomplish anything. Boots to Business program is set to benefit from $1.12 million in grants. On September 19, 2014, the U.S. Small Business Administration (SBA) announced that it has entered into a cooperative agreement with America’s Small Business Development Centers, SCORE, and the Association of Women’s Business Centers (AWBC). This co-op has agreed to provide a total of $1.12 million worth of funding needed to facilitate resource partner participation in SBA’s Boots to Business program. The SBA’s Boots to Business program provides training to transitioning service members and military spouses who are interested in business ownership. The program functions as part of the Defense Department’s TAP program. The original Boots to Business began as a pilot program in 2012, and was expanded in 2013. Each year, more than 250,000 service members separate from the military ranks. With their experience and leadership skills, Veterans have proven to be natural entrepreneurs. Veterans are more likely to be self-employed than those with no active-duty military experience. There are approximately 2.45 million Veteran owned small businesses in the U.S., making up approximately 9% of all American small businesses. Veteran owned small businesses employ more than five million Americans, generating more than one trillion dollars of sales receipts each year. Since January, 2013, more than 16,000 transitioning service members have participated in the two-day “Introduction to Entrepreneurship” class that was offered on 165 military installations around the globe. 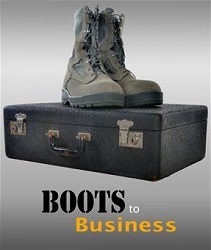 This year, the Boots to Business program was appropriated $7 million in the federal budget. To learn more about the Boots to Business Program and additional opportunities for veterans available through the SBA, visit www.sba.gov/vets. What information do you have on military business opportunities? Veterans wishing to start a military business have many different points of support, including organizations like VAMBOA (Veteran and Military Business Owners Association) and the Small Business Administration. A military small business can be difficult to get off the ground without obtaining military loans from a military lending network or company. Military small business loans are available for all veterans who meet the necessary requirements to qualify, including Service Disabled Veteran Owned Businesses (SDVOB). The Small Business Administration has the necessary materials you need to complete in order to be considered for one of their military loans or military small business loans. VAMBOA is a great organization to become a part of because it offers many networking opportunities for your military small business that you may not have access to otherwise. Some of the networking benefits VAMBOA offers to its veterans include connecting with other SDVOB and military business owners, obtaining corporate and government contracts to reduce the amount of military lending necessary to run your military small business and gaining access to conferences and seminars you might otherwise not be able to attend. Networking is crucial to the success of your military business, so take advantage of VAMBOA, using its connections to SDVOB and military lending opportunities. Registration for VAMBOA is absolutely free, which is the best kind of networking any military small business just starting out could want. The Small Business Administration is a key resource to have at your disposal when beginning or extending your military small business. The Small Business Administration has access to many military small business loans and other military loans that you can use to purchase vital equipment, space or machinery. Currently, the Small Business Administration is piloting a new program called the Patriot Express Loan Program, which provides military lending to new and expanding companies in different amounts of military loans. This program is available only to military business owners, SDVOB and veterans looking to start a military business. The program will only be accepting applications for military small business loans through the end of December 2010, so make sure to apply early if you are looking to obtain one of these military loans.